All tests on the wire mesh, lacing wire should be performed prior to manufacturing the mesh. 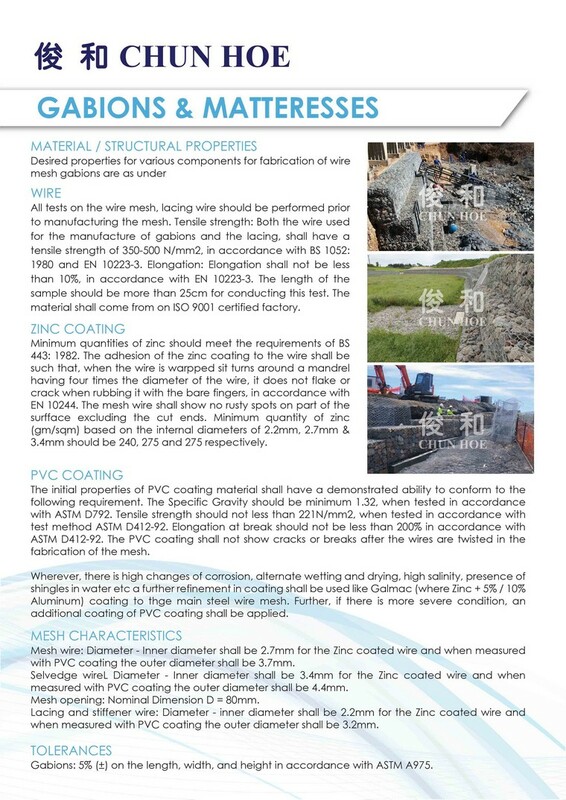 Tensile strength : Both the wire used for the manufacture of gabions and the lacing, shall have a tensile strength of 350-500 N/mm2, in accordance with BS 1052:1980 and EN 10223-3. Elongation : Elongation shall not be less than 10%, in accordance with EN 10223-3. The length of the sample should be more than 25cm for conducting this test. The material shall come from on ISO 9001 certified factory. Minimum quantities of zinc should meet the requirements of BS443: 1982. The adhesion of the zinc coating to the wire shall be such that, when the wire is wrapped sin turns around a mandrel having four times the diameter of the wire, it does not flake or crack when rubbing it with the bare fingers, in accordance with EN 10244. The mesh wire shall show no rusty spots on any part of the surface excluding the cut ends. MInimum quantity of zinc (gm/sqm) based on the internal diameters of 2.2 mm, 2.7 mm & 3.4mm should be 240, 275 and 275 respectively. 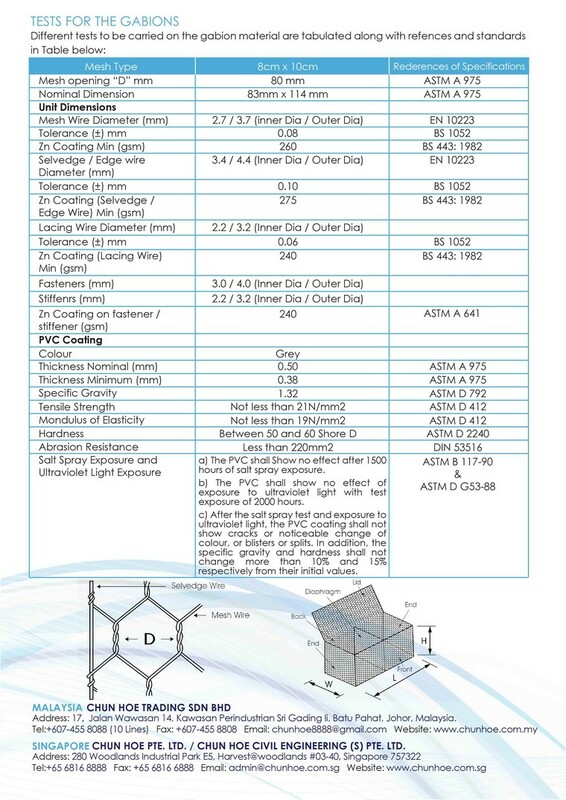 The initial properties of PVC coating material shall have a demonstrated ability to conform to the following requirements. The Specific Gravity should be minimum 1.32, when tested in accordance with ASTM D792. Tensile strength should not less than 221N / mm2, when tested in accordance with test method ASTM D412-92. Elongation at break should not be less than 200% in accordance with ASTM D412-92. The PVC coating shall not show cracks or breaks after the wires are twisted in the fabrication of the mesh. Wherever, there is high changes of corrosion, alternate wetting and drying,high salinity, presence of shingles in water etc a further refinement in coating shall be used like Galmac ( where Zinc +5% / 10% Aluminum ) coating to the main steel wire mesh. Further, if there is more severe condition, an additional coating of PVC coating shall be applied. Mesh wire : Diameter- Inner diameter shall be 2.7 mm for the Zinc coated wire and when measured with PVC coating the outer diameter shall be 3.7mm. Selvedge wire : Diameter- Inner diameter shall be 3.4mm for the Zinc coated wire and when measured with PVC coating the outer diameter shall be 4.4mm. Mesh opening : Nomial Dimension D= 80 mm. Lacing and stiffener wire : Diameter - Inner diameter shall be 2.2 mm for the Zinc coated wire and when measured with PVC coating the outer diameter shall be 3.2 mm. Gabions : 5% ( ± ) on the length, width, and height in accordance with ASTM A975.